Have a Plan. It is a good idea to have a general plan before your remodel starts. Be advised that your plan will most likely change several times throughout the remodel, but being flexible is part of the process. Since your kitchen will be under construction, plan out how you will eat for the next couple of months. That is right, months. Things happen during remodels, prices change, and orders are delayed. It is all part of the process. Our best advice to you is to roll with the punches. Do not let the little things get you down. Start each day with a grateful heart and you will be just fine. Avoid The Holidays. If you are planning on hosting Thanksgiving, you probably do not want to start a remodel in the fall. Even if you think you will be finished in the perfect amount of time. Give yourself plenty of time and wiggle room in case any unforeseen circumstances arise. Ask for Help. We have plenty of experience with floors! We are always happy to answer any questions you may have through the entire process. Plumbing. If you want a speedy remodel, do not move the plumbing around in your kitchen. Moving around the plumbing will add to the time and cost of your project. Understand Your Lifestyle. A good way to save money on kitchen appliances is to look at the way you currently use them. It is easy to spend a lot of money on high-end appliances, but you can save more on items that you do not use frequently. Read Reviews. Online reviews are a great source during your kitchen remodel. Keep in mind that one or two unhappy customers do not mean that a product or company is not worth your money. You will have to use your personal judgment to sift through the negativity. But use the reviews to help you decide on what products are worth your buck. More Storage. No one ever says “I have too much storage,” it just does not happen. We could all use more storage, especially in the kitchen. 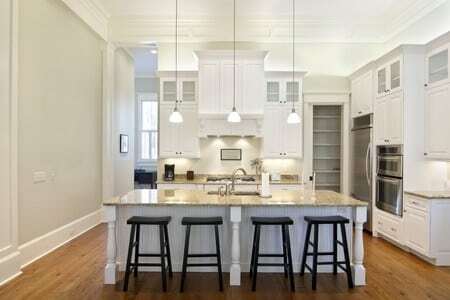 During your remodel, try to focus on adding more storage and cabinetry. You will not regret adding the extra storage. For more information on kitchen flooring, contact us or visit our showroom!